Park Guell, in Spanish Parc Guell, is one of Barcelona's most popular places to visit and is on UNESCO World Heritage List. 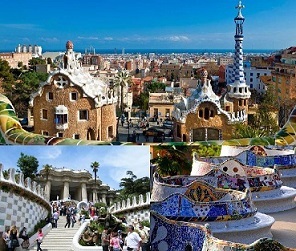 Many people think that the park is Antoni Gaudi's greatest artistic work. It is a must see for anyone visiting Barcelona. Park Guell was originally designed and built to be a very exclusive residential area with 60 houses and a huge and amazing garden. However, as the deal never came through, Barcelona City Council decided to donate the completed park in 1923 to the people and turned it into a public park. The park is located on a hill so it takes some time to get all the way up if you come by metro or bus, but it is absolutely worth your while. If you do not fancy walking you can also take a taxi to Park Guell gate. The nearest metro station is Vallcarca.